When you walk around Mayfair and find yourself on South Audley Street, you’ll see one of the most exquisite shop windows. One that looks like it’s from a different era- that’s where you enter the world of L.O.N.B. , luxury leather goods designed to accommodate and elevate the modern life. We can’t decide what we love more, the quality of the designs or the stunning setting they adorn. In this interview, L.O.N.B. co-founder and head designer Melissa Morris takes us through the craft, the inspiration and purpose behind her unique brand. In university I studied sculpture and business. I have always loved to draw lines and color inside them too. I suppose that explains the architectural quality to my work. I approach each bag design like I would make a sculpture. It also explains why each piece is so grounded in functionality. The entire collection celebrates an effortless intersection of form and function, which is really just an extension of my love for uniting creative and strategic thought processes. What made you want to create L.O.N.B. and start your own line of luxury leather accessories? I experienced a market gap and the more I looked around, the more I saw others experiencing the same thing. We all had a big tote with endless pouches to try to keep it from being a bottomless pit. But invariably each pouch became its own mini bottomless pit. The truth is that technology has changed all our lives- we are all on the go from morning to night but the inside of a bag has never changed! I wanted to create a collection which addresses the way we move through today’s world that unites luxury and practicality so you no longer have to compromise one for the other. 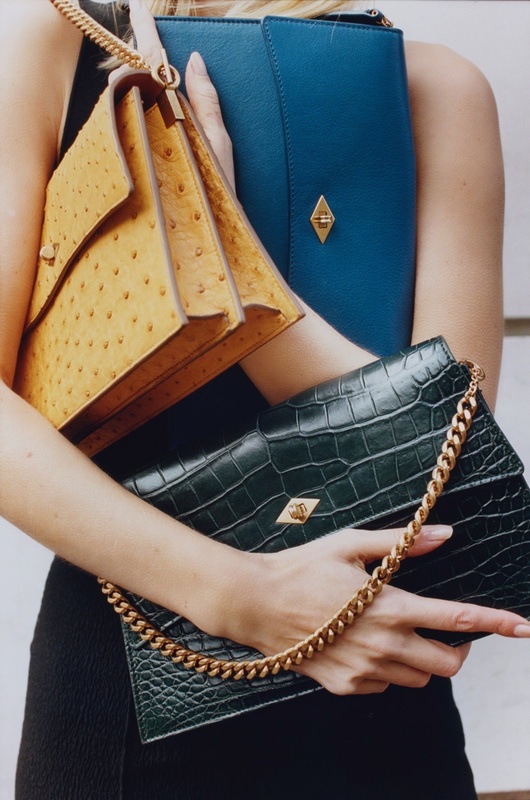 We are in love with the level of craftsmanship and design at L.O.N.B. ; tell us a bit more about the materials you use and how the products are made? Thank you! It’s something we are very proud of. I suppose simply said, we are incredibly uncompromising and take no shortcuts. We source only the highest quality leathers from Italy and France. Our leathers are natural and this allows them to slouch and get a gorgeous patina over time. We handcraft every piece in our atelier in Italy. All our hardware is made from solid brass and our zippers are the highest quality available so they move like butter. We are obsessed with all the details and ensure each one is reduced to perfection. We’ve spent over three years developing our unique method of craft. It was completely unheard of to craft a bag, which has a ton of functionality and modularity on the inside but is slouchy and lightweight on the outside. We didn’t want to use any heavy reinforcements or framing as that would make the bag both heavy and stiff. So we studied pressure points and developed a very unique way to create each piece. Every element is the perfect intersection of timeless elegance, perfected quality and unparalleled craftsmanship. We also extensively tested each piece in a facility in Italy to simulate rain, weight, humidity etc. to ensure it will stand the test of time. It is definitely a labor of love which is why LONB represents our philosophy, ”love or nothing baby”. How do you stay creative and what are your inspirations for your work? I take a lot of inspiration from architecture, interior and textile design. It’s all balances of form, function and soul. Currently I am exploring a lot of weaving and modern approaches to it. I am enamoured with Charlotte Perriand and Anni Albers. I also take a lot of inspiration from 1960s cars, boats and watches. It’s all references for uniting form, function and soul. I suppose within that I love geometric shapes and love balance and harmony in design. It should be surprising but pleasing to the eye. Visiting your beautiful store in Mayfair is like stepping back in time, what was the thought process behind the store’s design? We took vintage riva boats as a starting point but wanted to modernize it and ensure it wasn’t overtly thematic. What I love about the riva is it’s timelessness soul and warmth but boat design is also practical, you have to be so thoughtful about how you allocate space. We joke that being in the store is like being inside a bag, there are secret compartments everywhere! I love spending time in our store with our clients and spend as much time there as possible. My work is created for people and meant to make their lives easier. I love to see what they love in my work and what they want next. How would you describe your vision for L.O.N.B.? 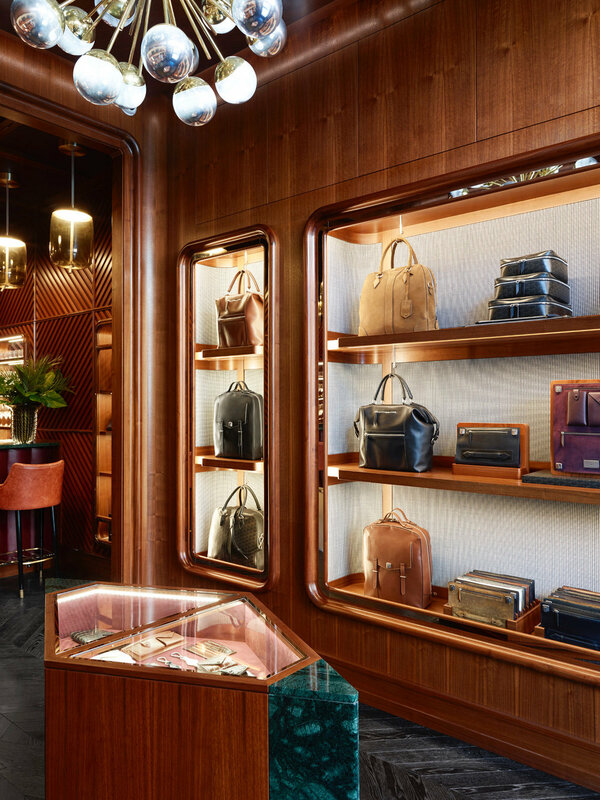 Timeless luxury leather goods redefined for the twenty first century. Do you have a favourite bag you carry at all times and why? Actually no, and we don’t have a “best seller” either, everything sells, it just depends on your specific needs. 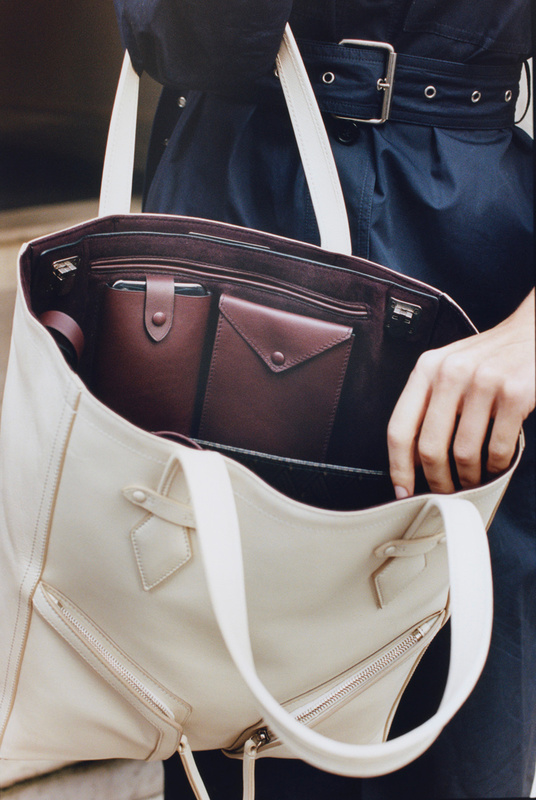 The collection is structured so there is one bag designed for each journey. And that particular bag is the perfect execution for that journey. We do provide lots of material and colour options, but the bags themselves are all so useful it really depends where you’re headed. We have a loft in Berlin and I go there to escape and work on new ideas. This is where I designed our first collection for L.O.N.B. When I travel, I carry The Rousseau Carry All, a piece from the collaboration I did with Silka Rittson Thomas from the TukTuk flower studio. I also rarely leave home without my Private Eye- I carry both in Atelier Calfskin Black. It’s the highest quality leather in the world and I cannot get enough of it. What are your views on aftercare and how do you keep your leather products in good shape? I believe working with people who truly care and don’t approach something in a routine manner. Whether it’s my workout class or the restaurants I go to... I look for care and passion everywhere. The same goes for how we can best take care of our things. That’s why I think The Restory is so fantastic. There is no sense of: it can’t be done. The artisan team at The Restory are true aficionados of leather and know how to best treat each individual problem. So I guess I don’t have a specific product I love for leather care but rather look for someone who knows and cares to help tailor a solution for me. What advise would you give to young accessory designers starting out and hoping to make it in the industry? Go your own way. Don’t follow the herds. Don’t disrupt for disruptive sake. But don’t be afraid to recognize the possibility of change. Don’t shy away when people aren’t happy about it; most people take comfort in stability. Hold firm and stay true to yourself, even when lots of experts tell you otherwise. And most importantly don’t ever lose touch with what drives you and fills your heart. Without it, it’s all for nothing.